Mayor Michael R. Bloomberg. Photo courtesy the Office of the Mayor. 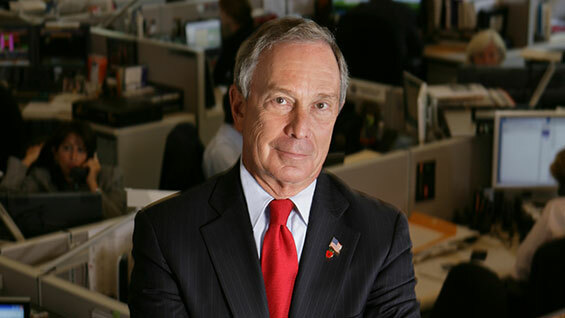 "We are proud and delighted that Mayor Michael R. Bloomberg has agreed to deliver the commencement address at The Cooper Union’s 154th graduation ceremony in May," said Jamshed Bharucha, President of The Cooper Union for the Advancement of Science and Art. At commencement, Mayor Bloomberg will receive the degree of Doctor of Humane Letters (honorary). Commencement 2013 is scheduled for Wednesday, May 29th in The Great Hall of The Cooper Union, East 7th Street at Third and Fourth Avenues, New York. "Mayor Bloomberg’s transformational leadership to improve education, the cityscape and the built environment, as well as public health, while encouraging smart and sustainable economic growth distinguishes his administration. His persuasive advocacy for gun control and immigration reform resonates across the country. His determination for New York to thrive as a world class applied science center will draw the best and the brightest for decades to come. His record and vision provide an example for our graduates who want to contribute their talents to New York and beyond. We are honored to have him deliver the keynote address at this year’s commencement," said President Bharucha. "The Cooper Union, a center of innovation, has long led the way in the disciplines of architecture, art and engineering," said Mayor Bloomberg. "Many of the professionals who designed and built New York City's most important infrastructure, buildings and transportation systems graduated from its outstanding programs, and their impact can be felt in every neighborhood of the five boroughs. I am delighted to accept President Bharucha’s invitation to give this year’s commencement address at this great institution of higher education." Commencement takes place in The Cooper Union’s historic Great Hall—a bastion of free speech and forum for the genesis of major social reform movements of the 19th and 20th centuries—where Abraham Lincoln delivered his “Right Makes Might” speech, widely credited with winning him the presidency. The Great Hall also hosted such innovators of social change as abolitionist Frederick Douglass, rights activist Chief Red Cloud, and women’s suffrage champions Susan B. Anthony and Victoria Woodhull.